With the volume of inspections carried out every week, it’s important that inspectors and municipalities have tools that enable them to use their time effectively and maximize what they can get done in a day. Yet, as with all aspects of a permitting or licensing workflow, efficiency isn’t just about transitioning from paper to electronic processes; ease of communication, accuracy of information, and clear assignment of responsibility are the biggest factors in finding success. At ViewPoint, we don’t just design tech for tech’s sake—we build to best facilitate the steps that need to get done and improve the resources for each employee on the job. That’s why the centerpiece of Inspections is the Inspections tab. Inspections is its own tab within the ViewPoint Cloud platform, and it serves as an interactive, visual insight tool into inspections as a whole. The view provides easy access into a given day’s inspections calendar, with viewing options according to individual inspectors or custom groups of inspectors. Browse the list of specific inspection types with record number, address, and inspection assignee on the left side of the portal. Or, scout the map view of inspection locations and routing suggestions on the right-hand side. As you’ll see on the map, intelligent routing can be enabled with a simple switch, and ViewPoint Cloud will optimize the most efficient route for each inspector’s daily assignments. Manual scheduling is still an option, but for ease of coordination and greater efficiency, intelligent routing both orders the inspections and guides the inspector on how to best travel from place to place. Within the Inspections view you can also easily reschedule missed inspections and re-assign inspections as necessary. Simply click the current assignee from the given inspection and adjust the date with a calendar picker or search for another employee to change the assignment. ViewPoint Cloud 3’s Inspections also includes the option for public scheduling requests. If this feature is turned on, applicants are sent an email to request a date for their inspection once the inspection step is next up in the workflow. From that email the applicant can click through to their ViewPoint Cloud profile where they’ll be primed with information on the inspection and prompted to request a date. The employee assigned to the step can then view the request and confirm or adjust the official scheduling as needed. Another significant feature upgrade is the in-the-moment inspection capabilities. Not only does ViewPoint Cloud allow for inspection results to be submitted on-site and become immediately available to all other employees looking at the workflow, but the granularity of the inspection logging itself has grown. Each inspection includes a build-your-own inspection checklist that can match the specific code ordinances that are being passed/failed. So the report breaks down the inspection into its parts, where the inspector can leave messages to the applicant couched under the relevant code ordinance. Inspectors can also attach files (including photos) during the inspection, with an icon preview of the file displayed after uploading. The completed listed result from the inspection can also be printed in a formatted view for record keeping or sharing. 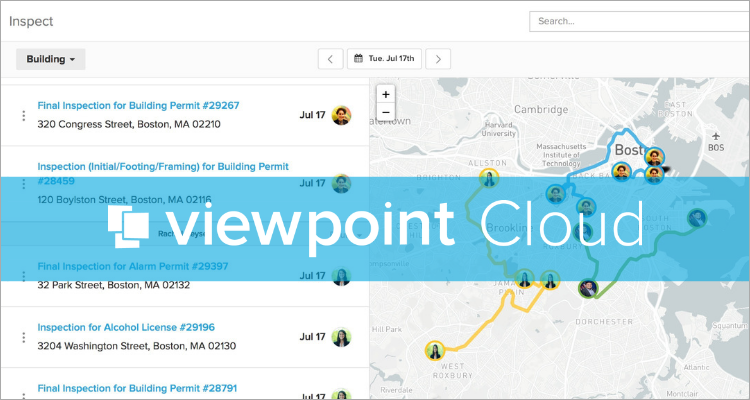 The Explore tab of ViewPoint Cloud takes you to the Reports interface where you can filter and view reports of unscheduled inspections, completed inspections, and more, in addition to customized reports, as detailed in our Reports feature overview. ViewPoint Cloud 3’s Inspections is specifically designed to respect current processes while enhancing usability, efficiency, and communication. We strive to empower inspectors with a higher level of management tools to take care of their day-to-day, while also better integrating inspections with the permitting process as a whole.